The Malaysian way: Chan explaining the building’s design concept. The PJ Trade Centre in Damansara Perdana has more occupants now following the launch of Menara Mustapha Kamal by Tun Dr Mahathir Mohamad recently. The building located along the Damansara-Puchong Highway (LDP) appears “incomplete” due to its modern design characterised by the use of raw, simple materials. The 2.2ha project consisting of four blocks of office buildings with 20 to 21 storeys each, one two-storey annexe building and about 2,000 car park bays was unveiled to the media in conjunction with the handover of Menara Mustapha Kamal, which occupies Tower A, to Emkay Group recently. It was the maiden project of developer Tujuan Gemilang Sdn Bhd run by executive chairman Ahmad Khalif Mustapha Kamal and executive director Peter Chan Sai Kong. 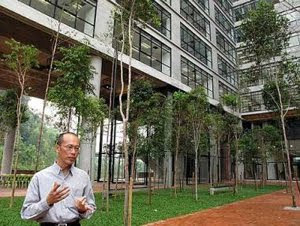 Chan took the media members on a tour around the project that emphasised on nature with 1,400 trees planted within the compound, as well as being energy saving and environmentally friendly with a strong Malaysian character. Mustapha said he was excited that the group was moving into its very own building after 26 years. Menara Mustapha Kamal is accessible by LDP, Penchala Link, New Klang Valley Expressway and PLUS North-South Expressway. SHARES in Malaysian property firm IGB Corp jumped by as much as 20 per cent today on foreign buying. By 4.36pm local time IGB shares were up 19 per cent at RM2.35 a share on volume of 20.18 million shares. The benchmark stock index was up 0.65 per cent. “Foreigners are looking to buy property stocks in Malaysia. The country itself is considered a laggard and property stocks are trading at a steep discount,” said a institutional dealer from a Malaysian brokerage. Market talk that the company is looking to sell its hotel assets may have contributed to the sharp rise in the share price, she said.